My 2011 Silver and Gold Finds! My 2012 Silver and Gold Finds! My 2013 Silver and Gold Finds! Hey there! Thanks for dropping by Kentucky Shooter! Take a look around and grab the RSS feed to stay updated. See you around! 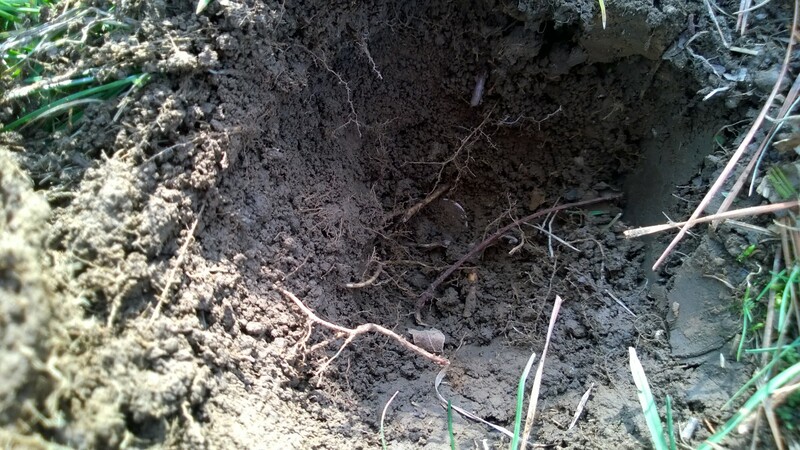 I’ve just had a lot of other stuff going on in my life the past year or so, and haven’t taken the time to get out and dig. Well, I broke the fast on Wednesday. I got out and hit a small yard of a rental home owned by some friends. The house is from the 1930’s, but the spot is really old. I’m confident that there was a LOT of other traffic on the site. Alas, I found nothing really “old,” but I did dig a couple of silvers. Here are the pics. It appears to me to be a Navy button. The size is 18mm. The back mark is “Scoville Mfg Co. – Waterbury.“ Any help on identification and date would be appreciated. I got out for a couple of short hunts today. This morning I met my buddy LEROY247 for a brief field hunt on an old homestead and Civil War skirmish site. We were both hoping to find a little bit of old silver … but it was not to be. We each found a couple of flat buttons, though. You can see in the pic below that my big one still has some gilt on it! It is marked “Silvester Birmingham.” I did a little online research and found that there was, indeed a gentleman named Silvester who owned a button company in Birmingham, England, which he sold around 1850 to emigrate to Australia. The other is a tiny oval-shaped button, evidently from a ladies’ garment. It was very difficult to locate. My coolest find this morning was the fired pistol ball (not sure of the caliber). I also found a knapsack rivet, a brass spoon bowl, and a couple of pieces of buckshot. This afternoon I returned to the church site where I’ve been digging the last few afternoons. 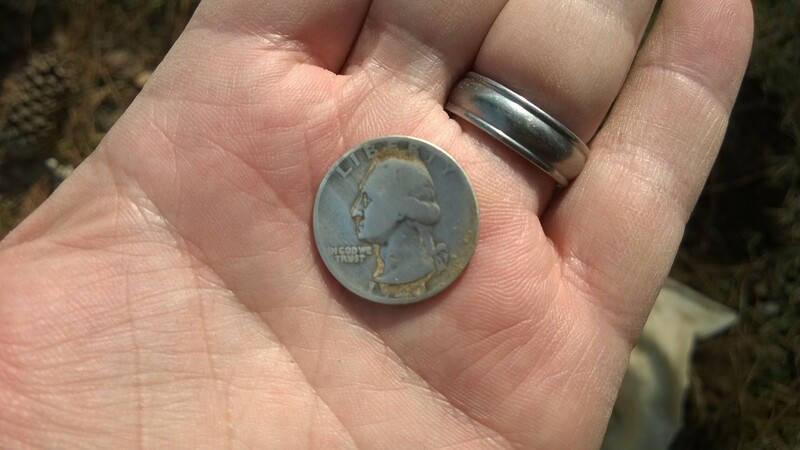 I dug 13 coins total, including three wheat pennies and a 1943-P War Nickel … MY 150TH SILVER COIN!!! It was an awesome detecting day! Rescued Two More Silvers From the Future Parking Lot! I returned today to the old church yard that is about to be paved over to make a parking lot for a new business. We had a few brief showers early this morning, but I headed out as soon as the rain stopped. 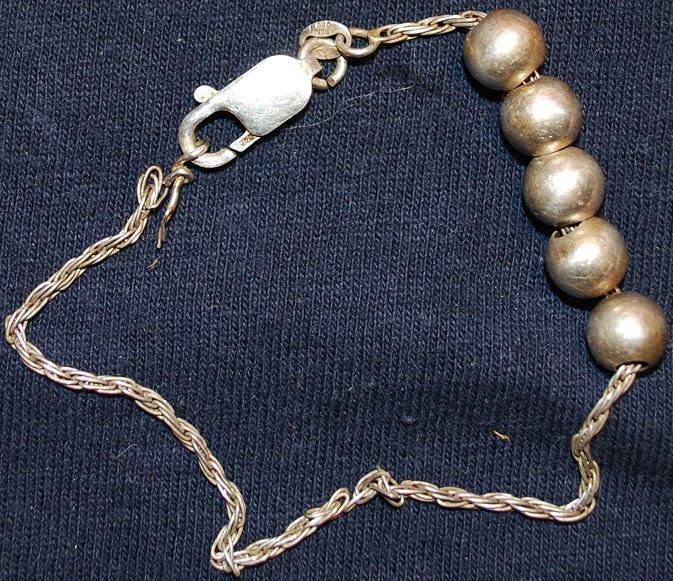 I dug four silver coins from the yard last year, as well as a sterling ankle bracelet. Yesterday I dug three small balls (hollow spheres) that had become separated from the bracelet that I found last year, as well as a silver Rosie. So I was hoping that my new E-Trac would help me find some more. I was NOT disappointed. This machine is a silver-sniffing beast. It smelled out two more Rosies, one a 1950-D and the other a 1959-D. Both were around six inches deep. The first was on edge. The second was about six inches from a rather large and noisy piece of ground trash. It wouldn’t pinpoint because of the trash. But I kept getting a hit with a high tone, so I dug under the high tone and there it was! My MXT couldn’t lock on to that signal, but the E-Trac separated it out just fine. I’m way impressed. So … two more silvers rescued from the asphalt that is soon to come. I’m going to try to finish hitting the spot early next week. I’m still hoping for a couple more strays. You can tell that by my nickel total. I tool my E-Trac to a site that I last hunted back in May 2011. It is an old church yard. The church has been sold and the yard is about to be paved. So I thought that I would take the E-Trac to the spot and see if I missed anything. I especially wanted to dig the deep, low tones. I’m convinced that there has to be a piece of gold there somewhere! Here is a big pic of my finds. My most interesting finds were the three tiny sterling silver balls. I found them in about a five square foot area, all three in different holes. None were closer than 18 inches from one another. But my beastly E-Trac sniffed them right out … gave me an awesome high tone. They all match a broken ankle bracelet that I dug back in May 2011. On that day I found the short chain (marked .925) and 5 balls in the hole. I’m pretty stoked to add another three silver targets to my 2012 total. Here’s a close-up. As darkness fell I was headed to my truck, swinging all the way … when I hit another awesome high tone. I was thrilled when I turned over the plug and saw this little baby on the bottom of my plug. It was shining … even in the dark. 🙂 It’s a 1946-D Rosie. My Gold Fast is Over! I took my E-Trac to an old spot for about an hour and a half this afternoon. I had declared it “hunted out” at least two years ago. I wanted to see if the E-Trac would pick up anything I missed. It’s a small, simple, bent and irregular wedding band. It’s clearly marked 14k. It weighed in at 2.6 grams of 14k gold, which amounts to .0487 ounces of pure gold … worth about $83.31 at today’s melt. Not bad for a short, cold-weather hunt! Blew my mind … someone actually watches my videos and reads my stuff. Anyhow, we made a quick connection and talked about getting together to hunt. So we finally made some time yesterday morning, right before a big shield of rain moved in. Leroy247 took me to a spot that he got permission for on a large farm. It’s an old homeplace settled in the late 1800’s and lived on through the 20th century. He also has permission to hunt all the farm fields, which is way awesome. 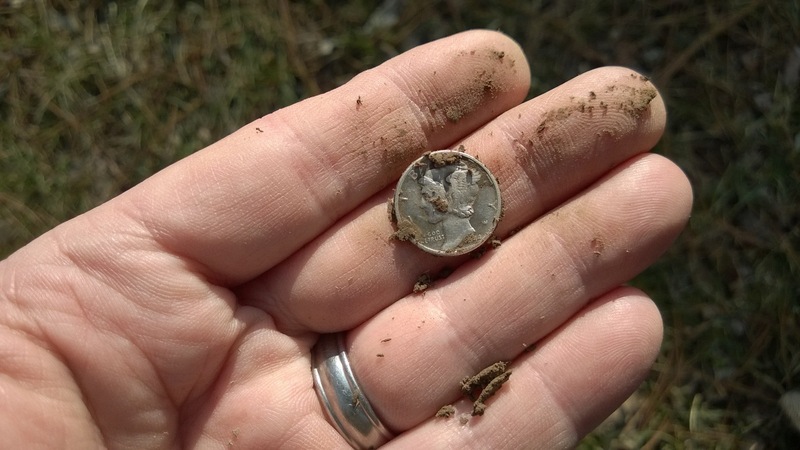 He struck silver first, with a nice Mercury Dime. And we each dug a sack full of wheaties (he had 9, I had 10) and a little clad. Two of my Wheats were pretty old, a 1917 and a 1920 … nice and green. I just happened to get my coil over a merc and two silver Washingtons. My E-Trac howled over the silver, with a perfect 11-47 on both. I called them before I dug them, which Leroy247 seemed to enjoy. Here is a picture of my digs, including a junque ring and dragon pendant (that had me fooled for a second … thought I had found a HUGE chunk of silver), and the top to a “Safety First” condom can from back in the day. Fun, fun. Thanks for reading. I hope to have the video ready tonight. I have continued to take my new E-Trac to places where I have hunted before. This time I returned to an old home on Main Street in my town that has been converted into a B&B. It was constructed around the turn of the twentieth century. It is a majestic old house built by a local doctor. I hunted the yard the first time in 2009 with my Garrett GTP 1350. I didn’t find any old coins at all. I remember being very disappointed. I did, however, find an old Ohio Civil War button and a Colt 45 slug, as well as a couple of flat buttons. But no old coins. I returned in 2011 with my White’s MXT. Again, I found nothing old. 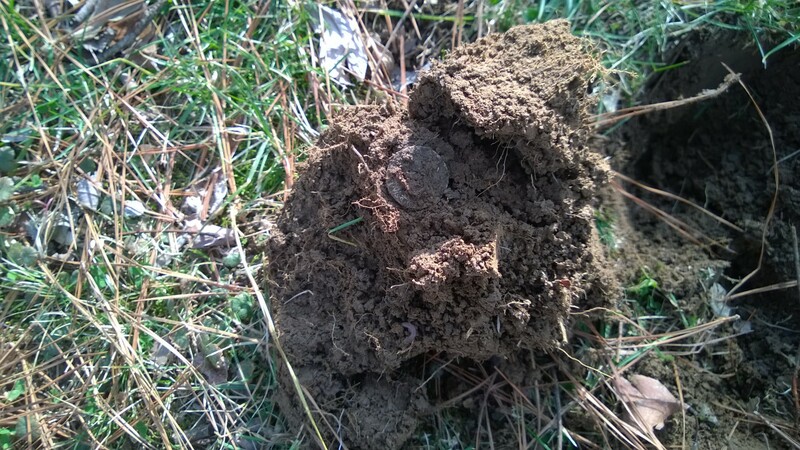 I found a few more clad coins and various pieces of old junk, but nothing special. So this week I called my buddy who owns the house to see if I could field test my new E-Trac on his hunted-out yard. He said, “Go for it!” So I hit it for two hours yesterday afternoon, covering most of the front yard. And the E-Trac did not disappoint! I was running the “Old Coins” program from the E-Trac “Bible.” And it really sniffed out the deep ones. Besides an oxidized piece of lead buckshot, the only other interesting find was a Survey Point Marker. OOPS! I thought it was an old button back. Anyhow, it wasn’t anywhere near a property line and it wasn’t attached to anything. Oh, well. My 2012 Gold and Silver Finds!